Today’s construction is not your father’s construction anymore. The construction industry is ever evolving with new and exciting technologies that arise everyday, these advances such as, Building Information Modeling (BIM), allow construction managers and architectural professionals communicate easier and build more efficiently, while giving clients a higher quality finished product. In layman’s terms, it means that we build the project before the physical project is built. BIM software (such as Revit, Microstation, Tekla, etc.) allows the design team on a project to construct a 3D model that represents the one we intend to build. By doing this virtually we can see how all the systems (architectural, structural, mechanical, electrical, etc.) integrate (or clash and redesign them so they don’t). In the past this would have been done by comparing flat 2D drawings or worse on site when the conflict is discovered. Clash detection is just one aspect of the benefits of BIM. You can imagine all the benefits you gain from building a full 3D model of your project: More focus on design as you can see the 3D relationship of components; Automation of many repetitive, labor intensive tasks, more precise estimation of building materials; Energy modeling and performance; etc. This applies to building architecture, interior fit-outs, infrastructure projects, and master planning. 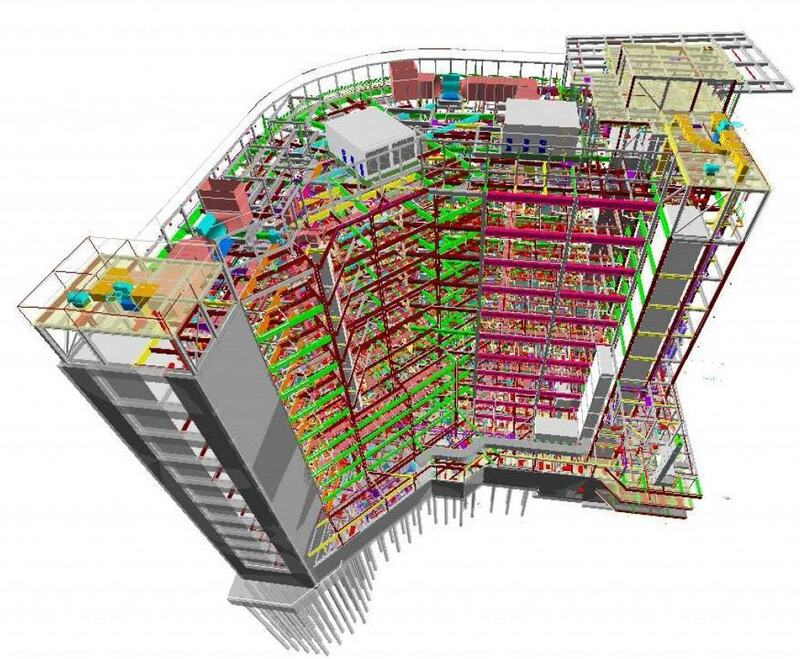 During the construction phase, BIM models benefit contractors by giving them a virtual copy of the project to reference. It can be used to examine site conditions without going to site. It allows them to coordinate phasing of construction by assigning the components of a model to a timeline. Example, you can see that there might be an issue getting the atrium glass in after you have sealed the exterior due to structural conditions. It also allows them to create “as-built” models of the exact conditions to, for example, quantify the materials on site. This can be a major cost savings that is extended to the owner. The Construction Industry Institute estimates that there is up to 57% non-value added effort or outright waste in previous construction business models. That translates to over $600 Billion in waste and costly delays in the construction industry each year. Post Construction Benefits: BIM can benefit owners and occupiers as the model can be used by the real estate/facilities management to know what what equipment is installed (for maintenance and repairs). They can also layer their own information into the model to give workstations individual names, IP numbers, desk sharing ratios, etc. So although BIM sounds like a big step for our industry, it is important to understand it’s actually a series of smaller ones. It’s up to firms and project teams to understand what level they are taking it to.